Optimizing nutrient uptake is a worthy pursuit. The financial rewards can be great, as growers aim to raise more bushels on the same amount — or even less — of nitrogen. And these efforts are vital to good environmental stewardship. A host of new advanced nitrogen modeling tools are taking fertility recommendations, an integral part of best practices, to a higher level. They’re based on data about nutrient movement and use variables including soil characteristics, weather, and crop yields. The science is complex, but companies are making it easier to use. Now in its third commercial year, the Adapt-N nitrogen modeling program from Agronomic Technology Corp. (ATC) can divide large fields into 60- by 60-foot grids and run independent N recommendations for each of those subfield zones throughout the season. Prior to commercial launch, Adapt-N had been developed and calibrated for 12 years. The work was led by Dr. Harold van Es at Cornell University, and included land grants, agronomists, growers, scientists, and industry experts. Adapt-N has been tested and calibrated in replicated strip trials to ensure accuracy across weather, soil, and field management permutations. Independent research validates a $30-per-acre grower profit using the tools. “We pride ourselves on superior accuracy and validation,” says Steve Sibulkin, CEO of ATC. Adapt-N is already being used at four of the 10 largest ag retailers — including Agrium, and WinField United — and across 38 states. It’s integrated as an “easy button” in many of the country’s largest farm management systems, he says. With Adapt-N, David Chaffin, Echelon Field Manager with Crop Production Services (CPS), Urbandale, IA, appreciates that the grower’s trusted advisers and Adapt-N users can control the data that defines a field — for instance, by identifying high-yielding zones. His territory ran recommendations on close to 20,000 acres last year; he expects the number to double in 2017. Pioneer’s Encirca Nitrogen service claims a 74% ROI increase over the standard nitrogen management practice. Pioneer’s Encirca services has been improving customer profitability for over three years now. 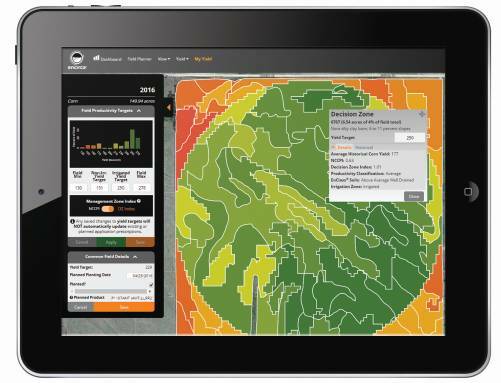 Encirca services’ predictive models are enhanced with field-by-field customized “decision zones.” These management zones are based on proprietary advanced soil type classifications — which can be further enhanced with growers’ multi-year yield history. Encirca services prescribe variable-rate and timing recommendations for seeding, NPK, and lime to help growers manage input costs and maximize profitability. Encirca’s soil data layers have been developed through collaboration with USDA and the University of Missouri. Encirca services combines these soil data layers with Pioneer’s own agronomy trials and “robust group of data scientists, crop modelers, and agronomy experts, who have been part of the company for decades,” says Travis Kriegshauser, Senior Services Manager with Encirca services at DuPont Pioneer. He reports growers following Encirca recommendations have seen average returns as high as 3 to 1 on their Encirca services investment. Encirca certified service agents (CSAs) are fundamental to their route to market. More than 300 agents across the Corn Belt come from diverse backgrounds in agronomy and precision agriculture. Kriegshauser says these CSAs are invaluable trusted advisors to growers as they navigate the opportunities of decision agriculture. Some companies’ offerings don’t generate actual fertilizer prescriptions but are providing data and modeling programs to assist. One example is Nitrogen Advisor, part of The Climate Corp.’s FieldView digital agriculture platform. FieldView draws data for its modeling from both public and private sources, including Climate’s and Monsanto’s own years of research. Climate is constantly running trials on collaborators’ research farms, and Anthony Osborne, Vice President of Marketing, estimates the company is ground-sourcing the model on approximately 40,000 acres. Nitrogen Advisor is expanding rapidly, with use on 15 million paid acres last year, and Osborne expects the total to exceed 25 million acres in 2017. And capabilities to do recommendations for N, P, and K are in Climate’s R&D pipeline. A veteran in this market, MZB is a cloud-based precision platform used by ag retailers to manage their field data to write variable-rate fertility and variable-rate/multi-hybrid seed recommendations from grid or zone data. The company has its own patented four-layer zone creation system. For 15 years, Wheat Growers Cooperative has been using MZB Technologies as its primary tool for managing crop nutrient recommendations. “By matching appropriate yield goals with defined productivity areas within a field, the system lends itself well to matching plant populations with these environments as well,” says Brent Wiesenburger, Precision Ag Manager. CPS’ Chaffin is in a good position to see the big picture of how different products can work together. Not only does he head up his division’s farm management software platform (Echelon) — which basically puts all its grower customers’ data “in one spot” — he’s a former data research agronomist with John Deere. CPS is a Climate Corp. dealer, and Chaffin has found synergies between Climate’s FieldView tool and the work he does with Adapt-N. For instance, the FieldView drive installed on equipment can wirelessly transfer data from a combine into Echelon. Then his team uses that yield data for applications like Adapt-N.
Another evidence of synergy: MZB is writing an API into Climate to help send data back and forth between their two systems. An agronomist can use MZB as his main platform, but may have a grower who uses Climate. “The agronomist can transfer data back and forth with a click of a button instead of doing it manually,” explains Jordan Tackett, Regional Sales Manager. He also has one retailer who uses MZB for keeping precision data — but uses Adapt-N to help make better decisions for nitrogen recommendations. ATC’s Sibulkin also sees agronomists using their N-Insight instant field diagnostic system for prospecting. They can visualize for a prospective grower the nitrogen dynamics in their field in several scenarios. This stimulates productive discussions about split application, rates, and more. Adapt-N is customized for retailers’ proprietary products, including N stabilizers or foliar fertilizers. “Growers want to be educated about these products, and retailers need better ways to demonstrate their field-specific ROI and agronomic benefits,” says Sibulkin. No matter the approach, though, dealers decide how they want to price, bundle, and tie Adapt-N into their brand. What advice would retailers using nitrogen modeling tools offer? Contacts for this feature encouraged fellow dealers to do their own research. Do side-by-side comparisons of the products, says Chaffin. One feature to look at, he says, is the validation research or ground-truthing that goes into each company’s model — how extensive is it, where does it come from. In addition, users may want to see if they can run “what if” scenarios for different N fertility programs. Then too, dealers can ask how mobile the product is, if it can be used on a desktop, laptop, tablet, or phone. In general, find out how easy is it to share data. Precision firms are also creating advanced technology around the iron end of application to help plants utilize nitrogen better. “Climate can come out and say you need another 30 pounds of N, but if the corn is at V10, chest high, how are we going to get that applied?” says Jim Hedges, a grower and consultant with Yield 360. In fact, at that growth stage, the corn still needs to get 75% of its total N needs, he points out. Yield 360 has developed the 360 Y-Drop sidedress tool. Multiple Y-Drops are placed along a boom, and they can apply nitrogen within 2 to 3 inches of the stalk base — which means nearly 80% of the root mass is in the application zone. Yield 360 has also developed the 360 Undercover system for foliar application of both nutrients (including micros) and crop protection products. Each Undercover unit, mounted on a Y-Drop riser, operates up to four multidirectional spray nozzles for 150-degree horizontal spray application.